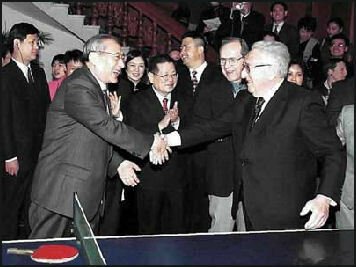 Nixon's visit was preceded by a tour of China by the American ping pong team in 1971. The American team had received a surprise invitation from China while they were playing in Japan. They were the first Americans to be invited to China since the Communist victory in China in 1949. Four days after receiving the invitation the 15-member team crossed into mainland China from Hong Kong. 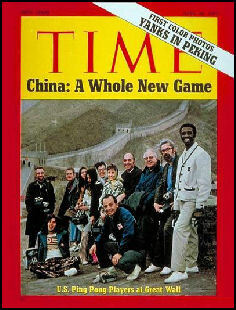 The team members were photographed in front of the Great Wall, made it on the cover of Time, but were thoroughly demolished in every game they played. Why did China invite the U.S. ping pong team and move towards establishing friendly relations with the United States. Historians believe that China was anxious about hostilities between Pakistan and India and between itself and the Soviet Union and felt that an alliance with the United States might makes its neighbors think twice before taking hostile action against China. The idea to invitate the team was said to be Zhou Enlai's. The ping pong team visited China at time when signs outside train stations read: “People of the world unite and defeat the U.S. aggressors and all their running dogs!” Even so the team was treated like royalty, with VIP trips to famous sites and lavish banquets. The player who drew the most attention was 19-year-old Glenn Cowan, a long-haired, self-proclaimed hippie from California who wore a T-shirt with a peace sign on it. The visit was followed by a tour by the Chinese ping pong team of the United States and an end of the trade embargo on Chinese goods in the United States. The whole episode began when Cowan befriended Zhuang Zeding, a legendary Chinese player at the World Championship in Nagoya, Japan in 1971. Photographs of their handshake was published in the Japanese press, giving Mao the idea of inviting the U.S. team to visit China. The invitation and the visit generated a diplomatic buzz that Nixon called “the week that shook the world.” Nixon visited China 10 months later. 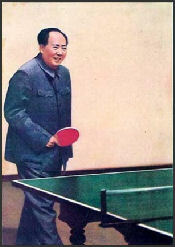 Mao is said to have loved the term “ping-pong diplomacy” attached to the event. A naturally gifted ping-pong player, Cowan grew up in New York and California and said publically that he liked to do drugs. He brought drugs with him to Japan and spent the night there with a woman he met in a bar. Several members of the U.S. Table Tennis Association wanted him excluded from the trip to China. Zhuang Zedong, three-time world champion, was seated near the back of the bus, A translator told him what Cowan had said. Zhuang later said, “Even now, I can’t forget that naive smile in his face.” While sitting in the bus Zhuang decided he would give Cowan a gift, and presented him with a brocaded tapestry woven the city of Hangzhou. Cowan stepped off the bus holding the tapestry with a smiling Zhuang at his side. Photographers captured the two smiling athletes together. The picture were printed on the front pages of Japanese newspapers and the story was picked up by AP and Agence France Presse. Later Cowan gave Zhuang a T-shirt with an American flag and a peace sign. In front of the media, Cowan was asked if he’d like to visit China he said yes he would. More news. Table tennis teams from Canada, Colombia, England and Nigeria had been invited and visited China before the American table tennis team did. Some Chinese officials thought the United States was fishing for an invitation by the way events unfolded in Nagoya. Chinese officials discussed the matter and rejected the idea of an invitation and the decision was forwarded to Mao as a formality. Mao took the briefing papers on the decision with him to bed, After taking his usual sleeping pill be came across press releases on the encounter between Zhuang and Cowan. According to Wu Xujun, Mao’s nurse, Mao looked at the photos of Zhuang and Cowan and exclaimed, “My Lord, Zhuang!” and said the American team should be invited. The only thing was that Mao had told Xu to disregard any directive he issued while under the influence of sleeping pills but Mao insisted he wanted to extend the invitation and refused to go to sleep until the order had been given to the foreign ministry. On the last day of the tournament in Nagoya, the leader of the Chinese delegation, who had avoided the slightest eye contact with any Americans, beckoned the leader of the American delegation to come over and asked how the U.S. delegation might react to an invitation. U.S. ping pond team with Zhou En Lai The 15-member U.S. Ping-Pong team was the first non-communist group of Americans to visit China since Mao came to power in 1949. They entered mainland China on the railroad bridge from Hong Kong. In China , the Americans team ate and ate, were photographed at the Great Wall, watched a ballet staged by Mao’s wife, and discovered that many Chinese had no idea that a man had landed on the moon. The Chinese threw many of their table tennis matches against the Americans. When he realized his victory in front of 18,000 people at Beijing’s Capital Stadium was charade, according to a team mate, Cowan muttered to his opponent, “F*** you, I’d have beat you anyway.” During the trip Cowan tried to make some business deals and lobbied to get himself on the cover of LIFE magazine. After the China trip, Cowan was diagnosed as a manic depressive and had drug problems. He became obsessed with Mick Jagger and Mao and freaked out when he didn’t take his medication. He worked for a while as a school teacher and sold shoes and was homeless for many years. He had heart bypass surgery when he was in his late 40s and died of a heart attack in 2004 at the age of 52. Only publications related to table tennis ran an obituary.